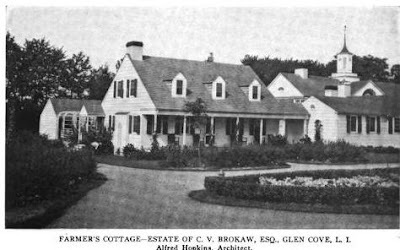 The farm group for 'The Elms', owned by Clifford V. Brokaw and designed by Alfred Hopkins c. 1912 in Glen Cove. The property sat just south of Lattingtown Road above the Pratt compound (though it has since been demolished and replaced with a housing development). 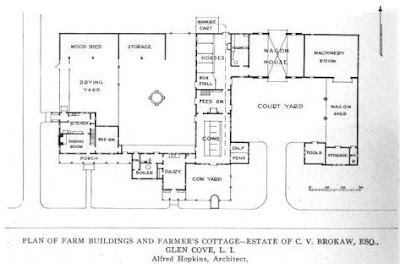 For those interested in Alfred Hopkins I encourage you to check out 'Modern Farm Buildings', a book Hopkins had published c. 1913 (and updated in 1920). Click below to see the C.V. Brokaw farm group intact in a 1966 aerial shot. 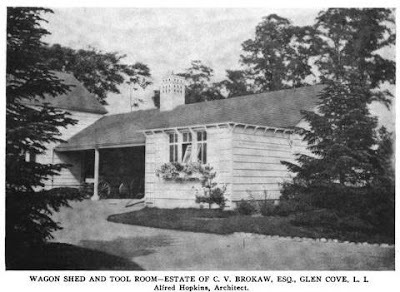 Pictures from Architectural Record, 1915. I think these farm groups are extremely charming. Often much more pleasing to the eye than the big house they accompany. 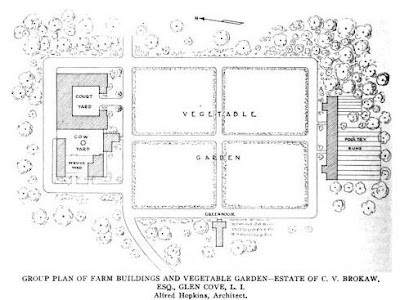 I agree this farm group is very charming, but am curious to see what the 'big house' was like. I hope that it too was published. Also, the Birdseye view of the property on Bing.com shows a rambling, single-story structure visible in the 1966 aerial still standing at the southwest corner of the property -- possibly an original estate building? When I was a young boy my father worked as an apprentice dog trainer for Mrs. B at what we called "The Farm". 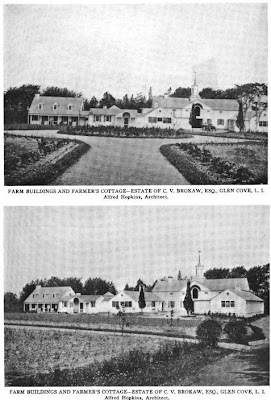 Mrs. B had a great adoration for Labrador Retrievers her master trainer Charlie lived in the farm hand home that is pictured here which if taking the road to the right would bring you down to a very secluded beautiful pond where we would assist training the dogs at that time late 70s she had about 15 labs. 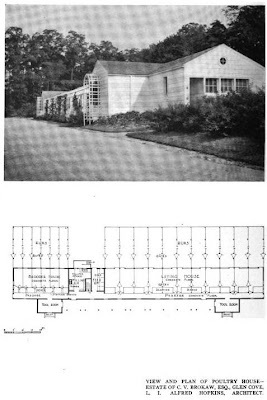 The comment left about the southwest corner was Mrs. B'S cottage it was very basic not like the other grand mansions but the interior was like a museum, until she sold the property in early 80s and moved to Lattingtown estates. It was really a beautiful piece of property and I remember very well.